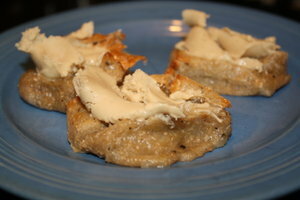 (usually barefoot) meg: Sesame-Garlic Mochi topped with Raw Cashew Butter: Yum! Sesame-Garlic Mochi topped with Raw Cashew Butter: Yum! Gluten free, dairy free, yeast free, no added sugars and Oh So yummy! We've been eating Grainaissance Mochi for years now (that and Edensoy were my two main purchases back when I shopped at the Detroit Food Co-op), but the Artisana Raw Organic Cashew Butter is a brand new find. When I brought it home Rob looked at the label and said, "Oh. It's raw." like I might as well just chuck it straight into the trash. But when I slathered some on top of a warm, gooey piece of sesame-garlic mochi he became completely silent. He finally admitted that it was utterly delicious and he was embarrassed to have been so wrong about it. lol! so what's mochi when it's at home? ... what is mochi? or what is mochi at home? i'm not sure i understand the second question. mochi is pounded rice. you can buy it in prepounded blocks. then we either fry it up in butter and serve it with maple syrup or we cut it into chunks and toast it in the toaster oven. Mmm... Mochi ... Oh, and when you have the time, try some Butter Mochi! that's an odd one. any idea how that came about? Same entomology as the "$10 word", I'd venture. You see people all dressed up for the opera, or whatnot, but at home, T-shirt and Jeans.
" What is it when it's at home? ie, Can you describe it in terms a 5th grader would understand? I've heard it myself, but only rarely, and long ago. I've no idea how this expression came about, but it's commonly used here in the UK - sometimes it could be a kind of dig at a person for using fancy lingo instead of speaking in "normal" terms (but I wasn't having a dig at you, I hasten to add). i would have said $100 word, not $10, but maybe michael was purposely shooting low. ..